You can count the number of notable smartwatch-related announcements at this year's Baseworld show on one hand. Tag Heuer made a golf edition of its Connected smartwatch, Alpina upgraded its stylish AlpinerX hybrid, and Fossil had some gorgeous new hybrids, while also announcing some err, new watch faces for its Wear OS smartwatches. So does this suggest smartwatches are on the way out? I don't think that's really the case here. We've covered enough analysts reports in the past few weeks to suggest the very opposite and that the popularity of the connected timepiece is firmly on the rise. When the Apple Watch thrusted the smartwatch into the limelight, traditional watchmakers seemed dismissive of the presence of tech companies like Apple in a playing field they had owned for so long. But times change fast, and eventually these companies caught on to what was happening. How were they going to get the next generation to wear its watches? So we started to see the likes of Tag Heuer, Mondaine, Alpina, the Movado Group and Fossil show off their smart wares in the same halls that you'd find a Pateke Philippe or a Rolex worth thousands of dollars. Even Samsung broke the mould and had its own booth at Baselworld 2017. But at this year's Basel, a show that major watchmakers including the Swatch Group decided to boycott, the smartwatch showing was perhaps the most low key it's been in recent years. 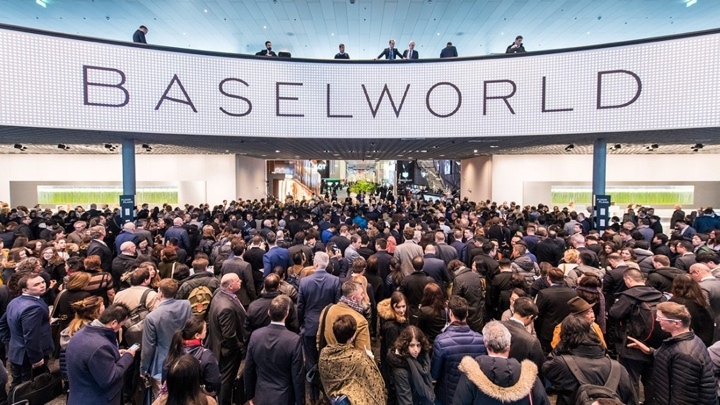 What this lack of smartwatches really seems to come down to more than anything is that the people that go to Baselworld are simply not coming for the tech. They want the lavish, extravagant timepieces; statement watches without a notification or step counter in sight. Smartwatches have certainly come a long way from a design point of view, but put an Apple Watch side-by-side with Tudor's new Black Bay 01 watch and these two things are worlds apart. It's becoming clear that tech is not wanted or all that welcome at the watch show that's clearly on the decline. But I don't necessarily see that as a bad thing or a slight on where we're at with smartwatches. A closer look at the few smartwatch announcements that did happen show you that. Tag Heuer - or more specifically the LMVH group that owns the watch brand - has been a great example how the two worlds can merge as one in a really satisfying way. Tag and fellow LMVH brand Louis Vuitton have provided us with some of the best smartwatches where it's quite apparent it's invested as much time in the design as it has making sure the software speaks to its fans and wearers of its traditional watches. The same can be said about Alpina, a Swiss watchmaker that has shown a real willingness to embrace tech. And we all know Fossil Group is showing no signs of slowing up its smartwatch push whether it's on its own watches or for others brands like BMW, Puma and Citizen. So the smartwatch talk at Baselworld was drowned out by the watchmakers that seemingly continue to shun them. The watchmakers that have no time or desire to take you away from your smartphone. But you know what? I think smartwatches are going to be okay without Basel, they'll just have to find a space where they are more welcome. I'm sure it won't be too long before that happens.